A condensed overview of the best on the international and local innovative music scene. The 19th edition of NEXT Festival (28.11.-1.12.2018) presents established names as well as newcomers worth following. Italian innovator Caterina Barbieri, Kuwaiti producer Fatima Al Qadiri, free improvisation legends AMM, synth pioneer Peter Zinovieff or Tanzanian hot topic Bamba Pana x Makaveli. From auditorium to ventilation system, on Wednesday, A4 – the Space for Contemporary Culture will reverberate with a special immersive show revolving around ‘The Pentacle’ 15.3-channel sound system, designed at the prestigious studio STEIM in Amsterdam. Its limits will be tested by Mexican Hugo Esquinca, Korean Ji Youn Kang, Berlin-based Slovak native Nina Pixel and the system’s architect himself, Fedde ten Berge. Four different perspectives on the physical properties of sound! Hugo Esquinca will explore the complex resonatory potential of A4. A failure of one’s sense of orientation was also experienced early this year at Berlin’s cult Berghain by the visitors of CTM festival. 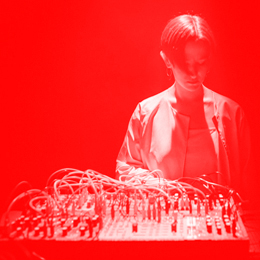 The sonically powerful concerts of Ji Youn Kang draw on the rich ritual aspect of the Korean shamanic tradition, forging it into gradating noise structures with a sense for detail by use of acoustical instruments (both traditional and new) and electronic systems. A balance between DJing, sampling and looping in the realm of dark sonic landscapes is struck by Nina Pixel. The festival’s opening evening will conclude with Fedde ten Berge – the Dutch sound artist will invite the audience to give up the comfort an impartial observer and assume responsibility for their own experience of his work. What does ‘live electronica’ mean in 2018? The two featured projects Ctrl Freq and DATANOISE will likewise explore new possibilities of engaging the audience. “In my case, every visible action causes an audible reaction, so what you see is what you get.” Sonic explorer, improviser and hacker Kacper Ziemianin specializes in creating interactive instruments. His light-based sequencer LightSeq is literally capable of manipulating sound by means of light. In a performance titled DATANOISE, Canadian audiovisual duo Pierre-Luc Lecours and Alexis Langevin-Tétrault probe new possibilities of interaction between gesture, light and sound on DIY instruments. This extremely physical experience, in line with Emptyset, Lanark Artefax or Fis, synthesizes sound, lighting design and video in a sense-overloading response to today’s ubiquitous smog of information. For the past 15 years, the Tanzanian megalopolis of Dar Es Salaam has been home to one of the most exciting underground electronic music scenes in East Africa. One of the flagships of this scene is duo Bamba Pana and MC Makaveli. Up-tempo beats, percussive patterns that sound oddly funny to the European ear and explosive phrasing – their unique take on the Singeli genre borrows from Zanzibar’s Tarab music. Its frenetic, digitalized version absorbs Western music influences, while remaining faithful to a rough-edged, DIY aesthetic. Their show will no doubt be one of the most energetic performances at this year’s NEXT. The club program also features Italian hypnotic duo Primitive Art, in-house DJ wyme as well as the notorious New York eclectic known as Total Freedom. The acclaimed club night Mäss collaborates with NEXT to bring his unique blend of recontextualized club music, which makes terms like underground and mainstream tumble down like a house of cards. Besides special projects, a slew of Slovak premieres and unique audiovisual performances, NEXT will also include an educational program packed with workshops, lectures and talks with genre pioneers such as British synth innovator Peter Zinovieff or trio AMM, who have broken ground in free improvised music since the 1960s.